You gotta love Russian President Dimitry Medvedev (or maybe not!). He’s the world’s most powerful Deep Purple fan. And it seems as if he updates his own Twitter account — at least the Russian-language version. Of course, it’s easy to assume that heads of state have teams of handlers who do their direct online communication for them. For instance, I’ve gone back and forth on whether Iranian President Ahmadinejad’s now-hacked blog broadcasted his personal musings direct-to-the-people. But judging by the personal voice of Medvedev’s Twitter feed (i.e. “My father taught a lot of graduate students from Vietnam. It was very nice to meet some of them today“), I’m thinking that he probably writes his own tweets, but maybe gets help uploading the photos from his SLR. 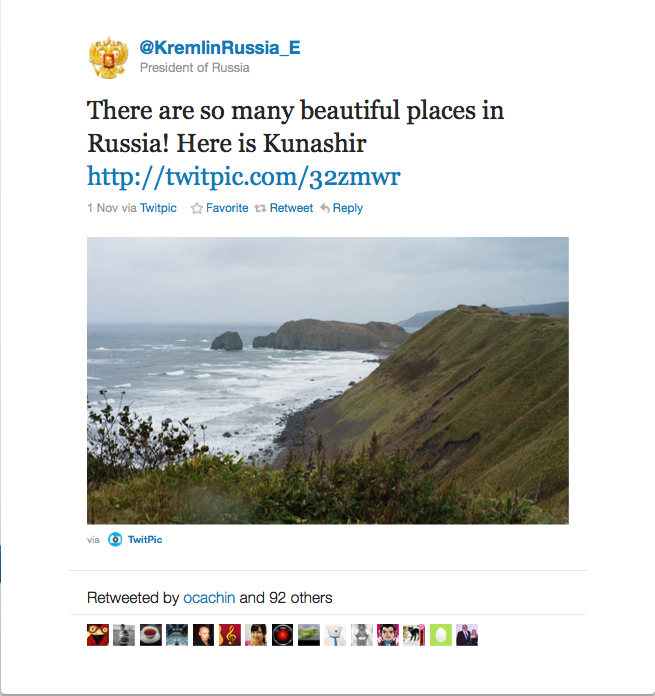 It’s a seemingly innocent post from a head-of-state on a public relations tour of the Kuril Islands. But the Soviet Union seized this territory immediately after Japan’s surrender in 1945, and they’ve been disputed ever since. So I think it’s pretty cheeky that Medvedev would use the informality — and directness — of social media to twist the knife, so-to-speak. Regardless of your position on this issue, you should see it as a unique passive-aggressive approach to diplomatic communications, which at the very least, isn’t couched in the usual double-speak of bureaucratic foreign policy. Rather, it aims for the jugular, not unlike a timeless, instantly-recognizable guitar riff. You know the one I’m talking about Mr. President! Originally posted to Storyteller Uprising. When I was growing up my brother had the Deep Purple album “Machine Head”, and he listened to “Smoke on the Water” over and over and over again. The first three notes bring me back to the 70’s instantly. So having heard that Dimitry Medvedev likes the same music as my brother (and me) makes me like him much better. I wonder though, was he able to get his hands on Deep Purple when their music was relevant – or did he have to catch up after 1991? Having heads of state tweet is endearing. I follow both the President of the United States and Finland on Twitter. Barack Obama’s tweets are generally disappointing as they are either boring or political – or both. Perhaps this is understandable as everything Obama says will be used against him in some way. You cannot find anything personal in his tweets so it is difficult to find his “voice”. The President of Finland, Tarja Halonen, just started tweeting a few months ago. Her tweets are cautious as well, but not so overtly political. She speaks from a place of an uncontested leader who is not running for office any more, and who leads a relatively united nation. She is a teacher and an “encourager”. Halonen has only 34 tweets and 4,194 followers; she follows no-one. Obama has 1,114 tweets, he follows 709,267 people and 5,976,448 people follow him. When I was twelve, I had to raise funds to fly to the former Soviet Union (as part of a storytelling exchange) to share thoughts with Russian school children. Today, I could do that via social media. And I wonder which medium has more impact. You’re absolutely correct that social diplomacy has an immediacy, and intimacy, that cables (Wikileaks, anyone?) or calls don’t convey; social media has attendant consequences. At least in this country, from my historical (and unconventional) perspective, POTUS can have social media channels managed by his/her staff, but they better not spend time with me online, hashing out policy positions! POTUS needs a buffer of time and space to consult with their staff of advisers, who can take the time to devise digital media strategies to collect and analyze citizen sentiment and opinion. What continues to engage me about social media is how it gets people talking who traditionally would not be communicating in any kind of casual conversation like Twitter. Social media has allowed us to see the personal side of “heads of state” and what I would of that of as just figure heads and not real people. It is so easy to feel removed from things as we watch the news and judge the decisions made by other countries. I believe social media has helped connect world leaders to “the people”…not only can we hear them but they hear us. Perhaps this open communication will help world leaders understand each other and their own citizens. By sharing our personal experiences across the globe we may just start seeing each other as real people…not just a news story.